Making mistakes is a part of being human. Even the best drivers sometimes find themselves accidentally speeding, just like some of the best police officers can mistakenly pull over a driver who isn’t actually doing anything wrong. If this happens to you, it can be helpful to have an idea of how to fight a speeding ticket. If you feel that you were unjustly pulled over, it’s understandable that you will be angry. However, displaying this anger in front of the traffic officer is not going to help your situation. Regardless of your innocence or guilt, you want to get on the officer’s good side. Misbehaving is going to destroy any chances of having things go well in court. If you want to fight your speeding ticket in court, you’ll need to have all of your information in order. Think of the facts surrounding your case as the ammo that will allow you to win the war. Not only will having everything organized keep the necessary information at your fingertips when you need it most, but it will also make you appear like a mature and intelligent person to the judge. When gathering your information, try to remember every detail you can about the day you were pulled over. Include everything–even the things that don’t seem to matter. What were you wearing that day? How was the weather? What exactly did the officer say to you when he or she first approached the car? You never know what might come up during your trial, and the more information you have, the better. Also write down the exact time and date you were pulled over, the radar reading that was presented to you on your speeding ticket and all of your current insurance and registration information. Show up on time for court, dress well and make sure to never miss a deadline. You want to do everything exactly by the book so that you look like the good citizen you are. When speaking with the clerk, attempt to be as friendly as you can. 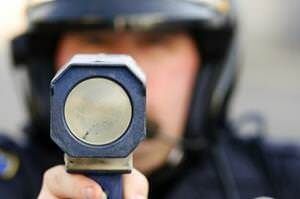 If you want to fight your speeding ticket, you must never admit to committing a crime. Instead, politely tell the judge that you plead not guilty. At this point, you’ll be assigned a court date where you can fight your ticket. If you get lucky, the officer who pulled you over might not even show up, which will result in your speeding ticket being thrown out. If not, you will be able to respond to your charges and make a case for yourself. If you have any witnesses who can testify to the fact that you weren’t actually speeding, it will help. You can also sometimes talk to the officer personally and have one last chance to get him or her to drop the charges. If the judge decides against you, there will be an option to appeal, but in most circumstances, it won’t be financially wise to do so. Attempting to get out of a speeding ticket doesn’t always work, and you might decide that it isn’t worth the hassle. Sometimes, life isn’t fair, and people get accused of things they didn’t do. If nothing else, going through this experience will remind you of the importance of always following traffic law in the future.